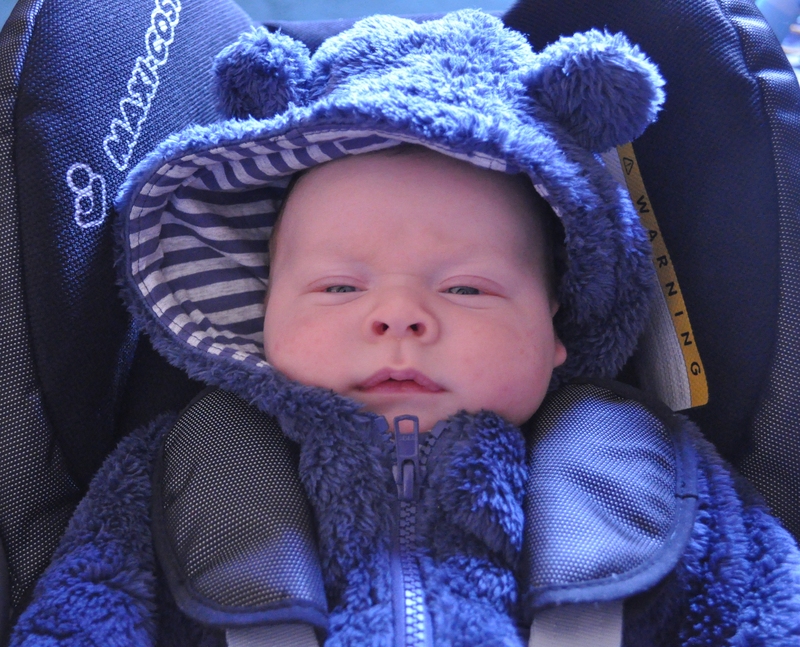 Vincent was six weeks old when we bundled him up on his first road trip: to my home city of Norwich, three-and-a-half-hours’ drive away, for the Easter weekend. It was a bit of a cheat – a holiday ‘lite’ – as we stayed at my mum’s house, complete with washing machine, homecooked dinners and round-the-clock relatives to hold him. Also, Vincent’s fairly easygoing: after a halfhearted fuss about being strapped into his Maxi-Cosi, his baby weir-pig snores lasted all the way to the A11. There’s no packing light with a little one. The car got jammed from foot to roof with Vincent’s things and, having been told by a grumpy Steve there was strictly no space for anything non-essential, I was wedged into the passenger seat with my feet hovering above Easter contraband: daffodils, a bottle of prosecco and a paper bag full of rhubarb. By the time we stopped for a break my calves ached from their unnatural suspension in mid-air. We were the only diners in the echoey hotel where we ate lunch – East Anglia’s answer to The Shining. The tall nervy housekeeper made a convincing Shelley Duvall, as she hovered over our table admiring Vincent and reminiscing about her grown-up son’s babyhood; how she would stroke his cheek until he fell asleep. It made me sad to think how much she must miss those days. We arrived safely. April showers and runny noses prevented us from showing Vincent the big skies and sandy beaches of my childhood Norfolk; instead we visited old friends, drank tea and scoffed my mum’s hot cross-less buns. (Our family’s Easter celebrations are almost entirely pagan.) It was perfect. And, most importantly, we had succeeded in taking the little man away on what I hope was his first of many happy holidays. I learned: Never underestimate the amount of ‘stuff’ you need to pack for a baby (consider buying a roofrack). Never apologise for your baby crying: babies cry.